In Genevieve Ko's blondies, macadamia nuts take the place of butter and flour. The sweet aroma of cookies baking wafts through the kitchen as the kids trample in and plead, "When are they gonna be ready?" Smile and reply softly, "Soon. But these are for the company, dear hearts." And these cookies will still be there when your guests arrive, because the kids will taste them and move on to the chocolate chips and frosted Santas. With twinges of flavors like anise, cardamom, basil, liqueur and coffee, these treats definitely appeal to grown-up taste buds. All Things Considered has gathered recipes from three bakers who suggest these adult holiday cookies. Genevieve Ko is a baker, food writer and author of Better Baking: Wholesome Ingredients, Delicious Desserts. She shares this recipe from her book. The butterscotch pleasure of blondies intensifies when macadamia nuts take the place of butter and flour. With a creamy richness that evokes pound cake, the roasted nuts blend with brown sugar into bars that are tender at room temperature and as chewy as fudge when frozen, which is how I love them. Miso, a Japanese soybean paste, adds a savory depth that gives these an alluring salty-sweet balance. Tip: White (shiro) miso, available in Asian and natural foods markets, is the sweetest and mildest of miso varieties. It also tends to be smoother. If you buy one made with just soybeans and rice, it should be gluten-free. Read the label carefully, though, since miso is sometimes made with wheat or barley too. Position a rack in the center of the oven and preheat to 350°F. Coat an 8-inch square baking pan with nonstick cooking spray. Line the bottom and sides with foil or parchment paper and spray again. Pulse the macadamia nuts in a food processor until chopped. Remove ¼ cup (36 grams) of the chopped nuts and reserve. Pulse the remaining nuts until finely ground, scraping the bowl occasionally. Add the brown sugar, baking soda, and salt and pulse until thoroughly mixed. Scrape the bowl, add the miso and vanilla, and pulse until incorporated. Add the eggs and pulse until smooth, scraping the bowl occasionally. Transfer the batter to the prepared pan and spread into an even layer. Sprinkle the reserved chopped nuts on top. Bake the blondies until the top is dark golden brown and a toothpick inserted in the center comes out clean, 25 to 30 minutes. Cool completely in the pan on a wire rack. Lift the blondies out of the pan using the sides of the foil or paper. To cut into perfectly even squares, freeze the blondies until firm, at least 30 minutes, then use a sharp knife to cut into 25 squares. Serve frozen, cold or at room temperature. The blondies will keep in the freezer for up to 1 month. Ignacio Alvarez is president of Lux Bakery, a family owned business in San Antonio established in 1965. Dip these cookies enough and it's possible to catch a buzz. You may find yourself "socially lubricated," says Alvarez. 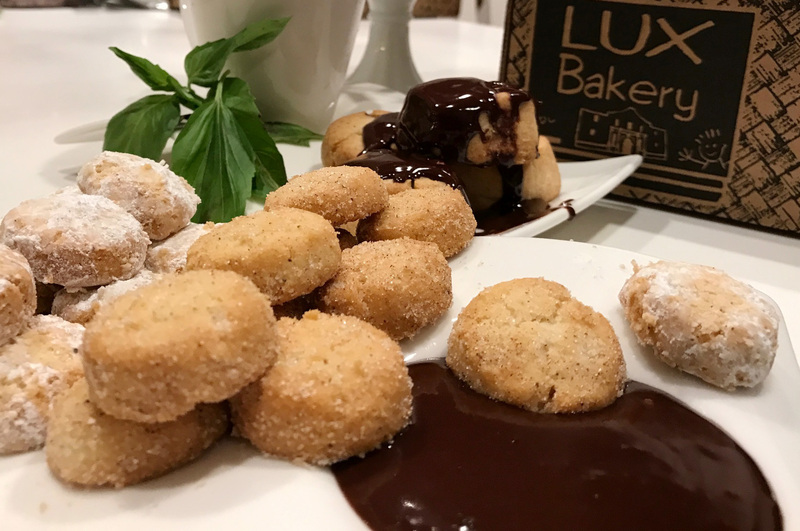 Ignacio Alvarez's Biscochitos with chocolate dipping sauce are flavored with anise. Makes approximately 2 lbs. batch in ounces and grams to measure quickly. Combine all of the dry ingredients except for the flour. Mix the dry ingredients with the shortening and lard until fluffy. Add wet ingredients again until fluffy. Then add the flour. Form dough into ½ oz. balls, place on a greased cookie sheet and flatten slightly. Bake at 350 degrees for 10 to 12 minutes or until edges brown. Chop the chocolate into small, even-sized pieces. Pour the cream into a saucepan and add the basil leaves, if using. Heat until just beginning to bubble, then add the chocolate, stirring with a whisk. Pour into a pitcher or strain through a fine-meshed strainer to remove the basil leaves, if using. Serve immediately. Dorie Greenspan's coffee cardamom cookies have freshly ground espresso in the dough. Dorie Greenspan is the author of 12 cookbooks, including the recently released Dorie's Cookies. She shares this recipe from her book. If spice cookies are good alongside coffee — and they are — then wouldn't they be even better with coffee in them? That was the question I asked myself and these cookies are the affirmative answer. These have freshly ground espresso in the dough (you can use whatever coffee you'll be drinking with the cookies or, in a pinch, instant espresso — but don't use as much: 2 teaspoons does the trick). I love that you can see the specks in the cookies. And although there's cinnamon in the mix, it's the addition of cardamom that makes these cookies extra special. The cardamom blends so beautifully with the coffee and cinnamon that it's elusive, but it adds spice and warmth. I bake these until they're set around the edges but still have a little give at the center. If you'd like them a bit chewier, bake them for less time. But don't bake them longer, since they crisp after a couple of days. The glaze is optional, but I like the look and the extra bit of sweetness that it brings to the cookies. A word on the glaze: The recipe calls for half an egg white. The easiest way to divide the white is to beat it lightly to break it up, and then measure out 15 grams. Or put it in a mini liquid measuring cup and pour off half. Whisk the flour, espresso, cinnamon, cardamom and salt together. Working with a stand mixer fitted with the paddle attachment, or in a large bowl with a hand mixer, beat the butter and both sugars together on medium speed until smooth, about 3 minutes. Add the egg and beat until well incorporated, about 2 minutes. Beat in the molasses and vanilla; don't be concerned if the mixture curdles. Stop the mixer, scrape down the bowl and add the flour mixture all at once. Pulse until the risk of flying flour has passed, then mix on low speed just until the dry ingredients are fully blended into the dough. You'll have a thick, very moist dough. Turn the dough out, gather it together and shape it into a disk. Roll the dough between pieces of parchment paper to a thickness of ¼ inch. Slide the parchment-sandwiched dough onto a baking sheet and freeze for at least 1 hour, or refrigerate for at least 2 hours. Center a rack in the oven and preheat it to 350 degrees. Line two baking sheets with parchment paper or silicone baking mats. Have a 2-inch diameter cookie cutter at hand. Peel away both pieces of parchment paper and put the dough back on one piece of paper. Cut out as many cookies as you can and place them on the lined baking sheets. Gather the scraps together, re-roll, chill and cut. Bake the cookies one sheet at a time for 11 to 13 minutes, rotating the sheet after 6 minutes, or until they are toasty brown on both the bottoms and tops. Poke them gently — they should be firm around the edges and softer in the center. Transfer the baking sheet to a rack and allow the cookies to cool for at least 20 minutes, or until they reach room temperature, before glazing (or serving) them. Repeat with the remaining dough, always using a cool baking sheet. Working in a medium bowl, whisk the egg white until it's foamy. Pour in the confectioner's sugar and, continuing with the whisk or switching to a flexible spatula, stir, mash and mix until the sugar is thoroughly moistened. It looks like an impossible job, but a little elbow grease will get it done. You'll have a thick mass. Push the mixture down and stir in the melted butter. If the glaze looks too thick to brush, stir in a bit of water a little at time until you get a workable consistency; you'll probably need less than 2 teaspoons of water, so go slow. You can spread the glaze over the cookies with a small icing spatula or butter knife (to get the same look as the cookies in the photo), or you can use a brush. Dip a pastry brush into the glaze, picking up ¼ to ½ teaspoon of glaze, and brush it over one cookie, brushing in one direction. Without taking any more glaze, and working perpendicular to the original direction, brush the glaze until you have a nice crosshatch pattern. Repeat with the remaining cookies. You can serve the cookies 15 minutes after they're glazed, but if you want to save them for later, place them on a lined baking sheet and allow them to air-dry for at least 1 hour before storing. The rolled-out dough can be refrigerated for up to 2 days or, wrapped airtight, frozen for up to 2 months. Cut and bake directly from the freezer. Covered with a piece of plastic wrap pressed against its surface; the glaze will keep at room temperature for about 4 days. Packed in a covered container, the cookies will keep at room temperature for 5 to 7 days. They'll get drier, but they'll remain delicious. Unglazed cookies can be wrapped airtight and frozen for up to 2 months. Warning - this next piece contains tasty-yet-anecdotal evidence based on generalizations. CORNISH: I mean pretty much everyone loves cookies, Ari. CORNISH: And this time of year, you may have noticed cookies are everywhere. CORNISH: As you think and plan for your next holiday cookie moment, we wanted to put a few more recipes out there. SHAPIRO: Under the subheading cookies for grownups - we're thinking treats with ingredients and flavors geared toward adults. CORNISH: So we asked three bakers for suggestions, starting with Genevieve Ko, author of "Better Baking." Her treat - gooey bars with a twist. GENEVIEVE KO: Miso macadamia nut blondies. They capture all the comfort and warmth of the blondies that kids love - the butter and the brown sugar. But I was really hoping to make them even more complex and more interesting while keeping the spirit of that butteriness. So what I did is I actually swapped butter and flour for macadamia nuts, which are so rich and creamy. If you've ever eaten one, you can tell right when you're chewing it that it has this buttery texture and buttery flavor. And so blending those macadamia nuts with dark brown sugar really gives you the effect of blondies. KO: But there's an added element here that gives it this salty, sweet flavor, and it comes from miso. Miso is fermented soybean paste. And when you put miso with something sweet, it not only gives you that delicious salty sweet balance in a dessert, but it has a lot of umami. KO: Umami is that fifth taste that we talk about in Japanese cuisine which - it's beyond salty in a really savory way, and it adds this extra oomph, this sort of funky, deep, savory flavor that honestly most children will not appreciate but every grownup will. SHAPIRO: That's baker Genevieve Ko talking about her miso macadamia nut blondies. CORNISH: Our next baker has a cookie kids will appreciate, but you'll want to keep them away from the sauce. IGNACIO ALVAREZ: Hello. My name's Ignacio Alvarez with Lux Bakery in San Antonio, Texas. I would like to share a outstanding cookie that we like for the holidays - biscochitos with anise. And that's a licorice flavor. ALVAREZ: Biscochitos is a shortbread cookie real close - in the same family as snickerdoodles. They are rolled in cinnamon sugar. Roll it when it's warm. When it's cool, the cookies that you didn't roll in cinnamon sugar - I roll it in powdered sugar. Then after I do that, I set it aside, and we add one more thing - liqueur but not in the cookie. We add it in a chocolate sauce for dipping. ALVAREZ: Chocolate with at least 50 to 80 percent of cocoa in it, heavy cream - heat it up. Add basil in there - about a pinch of it - and it actually adds a nice little flavor profile. And then we add Licor 43 or Kahlua, Frangelico, Bailey's. Of course these are really good liqueurs for the holidays, and the cool part is that as you keep eating them, you will get socially lubricated. And you can just dip into it with all the biscochitos with anise in it. Hopefully you'll enjoy it. CORNISH: That's Ignacio Alvarez of Lux Bakery in San Antonio, Texas. SHAPIRO: And we can verify this from personal experience. You should snack responsibly. His chocolate sauces really do pack a punch. CORNISH: The good news - our final cookie suggestion might perk you back up. DORIE GREENSPAN: I'm a coffee drinker. A lot of people are coffee drinkers, and I wanted a cookie that would be perfect with coffee. CORNISH: Not only that, they have ground coffee in them. SHAPIRO: Which is something I can definitely get behind. CORNISH: Here's baker Dorie Greenspan, author of "Dorie's Cookies," talking about her coffee cardamom cookies. GREENSPAN: Cardamom is a really interesting spice. It's one of these spices that once you get to know it, you'll recognize it because it's so unusual. It's a warm spice the way cinnamon is, but it also has a little tang to it, almost as though you had some lemon zest in there. It's not a flavor we really know in America, but it's a great flavor with the coffee, with the tiny little bit of cinnamon that's in there and with the molasses - oh, and the brown sugar. So you think it looks like a holiday cookie, a classic spice molasses cookie, but it's a trickster but such a delicious trickster. CORNISH: Dorie Greenspan's recipe for coffee cardamom cookies and the recipes for our other cookies for grownups - biscochitos with boozy chocolate sauce and miso macadamia nut blondies are at npr.org. SHAPIRO: So try making them, and don't forget to share. Transcript provided by NPR, Copyright NPR. Sweets this time of year take on all kinds of whimsical shapes: cookies cut into stars, stockings and gingerbread men, candy canes, peanut butter balls ... or logs covered in frosting. 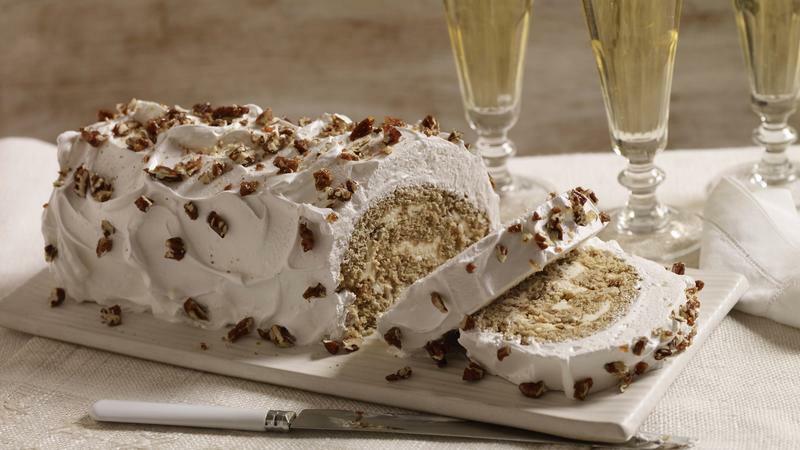 Not real logs, of course — these are holiday cakes, rolled and frosted to look like a yule log and known as buche de Noel. Sometimes the cakes are dotted with little meringue mushrooms or edible holly leaves. While the cake may not be on every American's baking list, cookbook author Dorie Greenspan says it's iconic in Europe.